IIT Roorkee Recruitment 2019 Notification for 16 Executive Engineer, Assistant Executive Engineer (Civil), General Duty Medical Officer, Chief Medical officer, Institute Architect, Assistant Registrar, Safety Officer, Hospitality Officer, Counselor Vacancies is released. From 1st March 2019 to 23rd March 2019, interested and eligible, candidates, can apply for the IIT Roorkee Recruitment 2019 before the Final date. Remember after submitting the applications in the Online Mode. Candidates, have to send the submitted application form to the mentioned address in the IIT Roorkee Recruitment 2019 Notification by 1st April 2019. 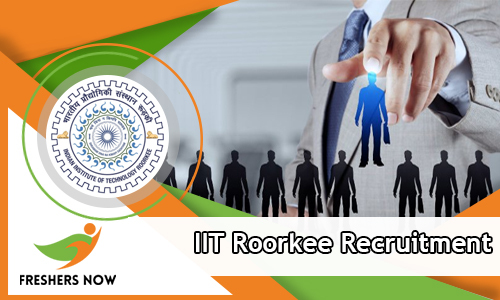 All the details mentioned in the IIT Roorkee Recruitment 2019 Notification are clearly given in the coming sections of this post. Moreover, the application process for the IIT Roorkee Recruitment 2019 has started a few days back. Therefore, aspirants need to apply as soon as possible. And, from the above table candidates can get the official website of the Indian Institute of Technology, Roorkee. Hence, aspirants can check more details from the official web portal. In addition to this, we have provided the same details on this page. Therefore, contenders need just to refer the below sections to get more details about the IIT Roorkee Notification 2019. Candidates will have to clear the bachelor’s degree, Post Graduate, Diploma from any Recognized Institute or University in India, as the Educational Qualification. For more details check the advertisement. Hope, the given post on IIT Roorkee Recruitment 2019 is useful to all the responsible candidates. Still, having queries applicants can leave a comment in the below comment box. And, visit our website Freshers Now frequently for the latest updates.